BY ACCESSING OUR SERVICES, YOU (ON BEHALF OF YOURSELF OR THE ENTITY THAT YOU REPRESENT) REPRESENT AND WARRANT THAT YOU HAVE THE RIGHT, AUTHORITY, AND CAPACITY TO ENTER INTO THESE TERMS (ON BEHALF OF YOURSELF OR THE ENTITY THAT YOU REPRESENT) AND ACKNOWLEDGE THAT YOU HAVE READ, UNDERSTOOD AND AGREE TO BE BOUND BY ALL OF THE PROVISIONS, CONDITIONS AND NOTICES CONTAINED IN THESE TERMS JUST AS IF YOU HAD SIGNED THESE TERMS. 1. Service Conditions. You cannot not use the Services unless you are at least 18 years of age, or (b) you are 13 years of age or older, obtain the consent of your parent or legal guardian to use the Services, and your parent or legal guardian agrees to be bound by these Terms and agrees to be responsible for your use of the Services on your behalf. By accessing the Services, you represent and warrant to us that: (i) either subsection (a) or (b) above is true; (ii) you have the right, authority and capacity to agree to, and abide by these Terms; and (iii) you shall not use any rights granted hereunder for any unlawful purpose or for any purpose which violates these Terms, as determined by us. 2. Grant of License. These Terms provide you with a personal, revocable, non-exclusive, non-assignable, non-transferable, limited and temporary license to access and use the Services. We shall be entitled to terminate, restrict, or suspend this license granted to you with immediate effect and without notice, including removing your ability to access or use the Services, for any reason or no reason, as determined by us. 3. Mobile Devices. If you are accessing the Services via a mobile device or tablet which is owned or controlled by you (a “Device”) then, subject to your compliance with these Terms and our Policies, the license granted hereunder allows you to access the Services using your Device. You understand and agree that use of the Services via your Device may result in data or other charges from your mobile communication service provider and you expressly release, indemnify, hold harmless, and defend us from any and all liability relating to any such charges and/or your Device. 4. Tax Preparation Services; Payment. (a) If you engage us to provide tax return preparation Services, you are subject to any applicable agreements (“Supplemental Agreements”) and any posted guidelines or rules applicable to such Services. All such guidelines, or rules, are hereby incorporated by reference into these Terms. Where a conflict exists between this Agreement and any of the Supplemental Agreements, the provisions of the applicable Supplemental Agreement shall govern. (b) In connection with Services used by you and/or provided by us, you agree to pay us any and all applicable fees displayed on the Website or otherwise communicated to you by us, as determined by us. Further, you authorize us to charge your chosen payment method (credit card, debit card, et cetera) in connection with all fees incurred by you in the Services, as determined by us. In connection with any fees paid by you, you agree: (i) to only provide valid and current payment information; (ii) that we may use the tools, software or services of our payment processors (currently, merchantwaresolutions.com and refund-advantage.com) to process fees and transactions on our behalf; and (iii) that you agree to promptly pay all amounts due upon demand. We are not responsible or liable for any activities or conduct of our payment processors, and you agree to hold us harmless, and expressly release us, from any and all liability arising from the conduct of our payment processor. All fees shall be paid in US Dollars. You understand and agree that we do not offer any refunds of fees paid to us in connection with the Services for any reason. 5. Content and User Content. (a) By Us. All Posts and Content on the Services, or obtained from a Linked Site (defined below) are provided to you ‘AS IS’, ‘AS AVAILABLE’ and ‘WITH ALL FAULTS’. ATC provides the Services for informational purposes only. Any statements made by us and available through the Services are for informational purposes only. None of the communications in any Post on the Website, as they may relate to a federal tax transaction, matter, or concern shall be considered a ‘covered opinion’ as described in IRS Circular 230 and therefore, none of the Content on our Services may be relied upon in an attempt to avoid penalties imposed on the taxpayer by the U.S. Internal Revenue Service. OUR SERVICES, INCLUDING BUT NOT LIMITED TO ANY CONTENT DOES NOT CONTAIN OR CONSTITUTE, AND SHOULD NOT BE INTERPRETED AS, LEGAL ADVICE. ATC is not a law firm. The information made available on or through the Services should not be relied upon when making legal decisions. We expressly disclaim all liability related to the accuracy or reliability of any opinion, advice, or Content on the Services or reliance on any of the aforementioned. The information, items, or descriptions of items or information published through the Services may include inaccuracies or typographical errors. We use reasonable efforts to provide you with useful Content, however, we do not warrant or represent that the Content available through the Services is complete or up-to-date. (ii) Third Party Products and Services. When you use the Services to purchase or use products or services from a Linked Site, you understand and acknowledge that you are purchasing that product or service directly from the third party Linked Site and not from ATC. If you purchase products or services from a Linked Site, your order is placed with, filled by, and shipped by that third party Linked Site. We have no involvement in any shipment, fulfillment, returns, or refunds associated with any products or services that you purchase from or view in connection with a Linked Site or third party. We can answer no questions and provide no information with regard to any Linked Site, and you understand and acknowledge that you must contact the third party Linked Site directly for inquiries related to any interactions you may have with Linked Sites, including but not limited to: returns, shipping, customer service, refunds, and general information. By using the Services, you expressly represent and warrant that you will abide by and will not violate any policies, rules, terms, or conditions of that third party Linked Site. (i) You are solely responsible for and retain all rights in the Content that you create using the Services or Post on the Website or transmit to us or other Users (“User Content”). You agree that you will not Post User Content containing obscenities, as determined by us; Post User Content of people who have not given permission for their images to be uploaded to the Services; Post User Content that infringes on the intellectual property rights of others; Post any User Content which violates any provision of the use restrictions in Section 12; and/or Post any objectionable User Content as determined by us in our sole discretion. WE ARE NOT RESPONSIBLE FOR ANOTHER’S MISUSE OR MISAPPROPRIATION OF ANY CONTENT OR INFORMATION YOU POST USING OUR SERVICES. (ii) You will retain ownership of your User Content. However, you also agree that by Posting Content anywhere within, on, or using the Services, you automatically grant to us an irrevocable, perpetual, non-exclusive, paid-up, royalty free license to use, copy, sell, and distribute such Content in any way and to prepare derivative or collaborative works of such Content of any kind, as well as authorize us to license and sublicense any of the aforementioned Content, each as determined by us, and without attribution of any sort. You further agree that we have the right to promote any Content through social media profiles (such as Facebook, Twitter, Instagram, et cetera) (collectively, “Social Media Profiles”), as determined by us in our sole discretion. You agree that any User Content you Post is not being disclosed in confidence or trust and that no confidential or fiduciary relationship is intended or created between you and us in any way, and that you have no expectation of any review, compensation or consideration of any type. To the extent any ‘moral rights’, ‘ancillary rights’, or similar rights in or to the User Content exists and are not exclusively owned by us and to the extent you are able to do so under applicable law, you agree not to enforce any such rights as to us or our licensees, distributors, agents, representatives and other authorized users, and you shall procure the same agreement not to enforce from any others who may possess such rights. Without limiting the scope of the license granted to us by you hereunder or any future grant of rights, consents, agreements, assignments, and waivers you may make with respect to User Content, and to the extent allowed by applicable law, you hereby ratify any prior grant of rights, consents, agreements, assignments and waivers made by you with respect to User Content you Post on the Website or to us or other Users. (v) You agree and understand that you may be held legally responsible for damages suffered by other Users or third parties as the result of your remarks, information, feedback or other Content Posted on the Services that is deemed defamatory or otherwise legally actionable. Under the Federal Communications Decency Act of 1996, ATC is not legally responsible, nor can it be held liable for damages of any kind, arising out of or in connection to any defamatory or otherwise legally actionable remarks, information, feedback or other Content posted or made available on the Services. 6. Contests. From time to time, we may give away cash, products, and services, subject to these Terms (collectively, “Contests”). Information regarding Contest entry, winner selection, supplemental rules, and other matters shall be Posted to the Website from time to time (“Contest Postings” and such Content regarding Contest Postings are incorporated herein by reference. In the event of a conflict between the provisions of these Terms and any Contest Postings, the provisions of these terms shall control. 7. Data Access and Storage. In order to use the Website, you must obtain access to the Internet and pay any service fees associated with such access. Access to the information available on the Website may be limited or unavailable for reasons which may include but are not limited to, telecommunications failure, hardware failure or software failure. You are responsible for your use of your Internet browser, the Website, and the services and information provided on the Website. We are not responsible for deletion of data, timeliness of services, or the failure to store any of your data or personalization settings. 8. Advertisers. With respect to any Affiliate (as defined in Section 10 below) or third party that Posts advertisements on the Website, including but not limited to by placing banners on the Website (each an “Advertiser”), Advertiser’s advertisements are subject to a separate agreement with us as well as our policies regarding advertisements (collectively, an “Ad Agreement”), which is hereby incorporated herein by reference. The rights and obligations of an Advertiser and us are established by the Ad Agreement. In the event of a conflict between the provisions of an Advertiser’s Ad Agreement and these Terms, the provisions of the Ad Agreement shall control and the remaining provisions of these Terms shall be supplemental and remain in effect. (a) Trademarks. ATCINCOMETAX.COM, ATC INCOME TAX, and ATC FINANCIAL LLC, and all other graphics, logos, page headers, button icons, scripts, service names and other Content that we use, manage or control are trademarks, registered trademarks or trade dress of ours or our subsidiaries, officers, employees, independent contractors, suppliers, representatives, advertisers, licensors, licensees, successors, assigns, agents, partners, or other affiliates (collectively “Affiliates”) in the United States, other countries, or both. No one may use these trademarks or trade dress without our express written permission. All other trademarks that appear on the Services are the property of their respective owners, who may or may not be affiliated with, connected to or sponsored by us or any of our Affiliates. (b) Copyright. Except in the case of Content under license to us, we claim a copyright, and all copyright protection afforded, under international, United States and the laws of the State of Georgia to all text, graphics, logos, button icons, images, audio clips, digital downloads, data compilations, software (ours or our software suppliers), and all other Content on the Services. The compilation of all Content on the Services is our exclusive property, and it is similarly protected. We also claim a copyright, and all copyright protection afforded, under international, United States and the laws of the State of Georgia to all material described in the trademarks section above. Your access to all information and Content located on the Services is strictly permitted through the license granted to you under these Terms. Except for the license granted in these Terms, all rights, title and interest in Content, in all languages, formats and media throughout the world, including all copyrights, are and will continue to be the exclusive property of ours and other parties. Except as permitted by these Terms, you are prohibited from modifying, copying, distributing, displaying, publishing, selling, licensing, creating derivative works, or using any Content available on or through the Services without our prior written permission, or in the case of Content owned by a third party, without first receiving permission from the owner of that Content. You may not alter or remove any trademark, copyright or other notice from copies of the Content. (c) Infringement Claims. We respect the intellectual property of others and ask that Users do the same. In connection with the Services, we have adopted and implemented a policy in accordance with the Digital Millennium Copyright Act of 1998 (the “DMCA”) respecting intellectual property that provides for the removal of any infringing or unauthorized materials and for the restriction of a User’s ability to use the Services, in appropriate circumstances, if such User infringes on the intellectual property rights of others. If you believe that a User is, through the use of the Services, unlawfully infringing by submitting unauthorized Content, and wish to have the allegedly infringing or unauthorized material removed, the following information in the form of a written DMCA notification (pursuant to 17 U.S.C. § 512) must be provided to our designated copyright agent (“Designated Agent”): your physical or electronic signature; identification of the works or rights that you claim to have been infringed; identification of the Content on our services that you claim is infringing and that you request us to remove; sufficient information to permit us to locate such Content; your address, telephone number, and e-mail address; a statement that you have a good faith belief that use of the objectionable Content is not authorized by the copyright or other rights owner, its agent, or the law; and a statement that the information in the notification is accurate, and under penalty of perjury, that you are either the owner of the copyright or other right that has allegedly been infringed or violated or that you are authorized to act on behalf of the copyright or other rights owner. Note that, pursuant to 17 U.S.C. § 512, any misrepresentation of material fact in a written notification automatically subjects the complaining party to liability for any damages, costs and attorney’s fees incurred by us in connection with the written notification and allegation of copyright infringement. 11. Linking To Our Website. You are granted a limited, revocable, non-exclusive right to create a text hyperlink to the Website, provided that such link does not portray ATC or any of its products and services in a false, misleading, derogatory or otherwise defamatory manner and provided further that the linking website does not contain any material that is offensive, harassing or otherwise objectionable. This limited right may be revoked at any time and for any reason or no reason, as determined by us in our sole discretion. Upon such time as we notify you that your limited right to link to the Website has been revoked by us, you agree to immediately cease using and remove any and all links to the Website which were previously created, used, or controlled by you. You may not use an ATC logo or other proprietary graphic of ATC to link to this Website without the express written permission of ATC which we may withhold in our absolute discretion. Further, you may not use, frame or utilize framing techniques to enclose any ATC trademark, logo or other proprietary information, including the images found on the Website, any text or the layout/design of any page or form contained on a page of the Website without ATC’s express written consent. Except to the extent you may link to the Website as noted above, you are not conveyed any other right or license by implication, estoppel or otherwise. 12. Use Restrictions. You may not use or plan, encourage or help others to use the Services for any purpose or in any manner that is prohibited by these Terms or by applicable law. In using the Services, you agree at all times that you shall not: (a) infringe on the copyrights or other intellectual property rights of ATC, a User, or a third party (b) copy, distribute, or modify any part of the Services without our prior written authorization; (c) Post inappropriate, inaccurate, false, misleading, or objectionable Content to the Services, as determined by us; (d) transmit any Content which contains software viruses, or other harmful computer code, files or programs; (e) Post Content that falsely states, impersonates or otherwise misrepresents your identity, including but not limited to the use of a pseudonym, or misrepresenting your current or previous positions and qualifications, or your affiliations with a person or entity, past or present; (f) make threats or use profanity; (g) harass, stalk or intimidate other Users; (h) manipulate or exclude identifiers in order to disguise the origin of any Content; (i) disrupt the networks connected to the Services, including but not limited to by: attempting to probe, scan or test the vulnerability of the Services, attempting to breach security or authentication measures without proper authorization, or attempting to interfere with the Services or a User, by means such as overloading, ‘flooding’, ‘mailbombing’ or ‘crashing.’; (j) circumvent, disable or otherwise interfere with security-related features of the Services or features that prevent or restrict use or copying of any Content or that enforce limitations on use of the Services; (k) collect Content, personally identifying information, and/or other information from the Services, or otherwise access the Services, by using any automated means, including but not limited to, ‘robots’, ‘spiders’, ‘scrapers’ and ‘offline readers’, without our prior written approval which we may withhold in our discretion; (l) modify, translate, reverse engineer, decompile, disassemble, create derivative works based on, sublicense, sell, or distribute the Services; (m) rent or lease any rights in the Services in any form to any third party or make the Services available or accessible to third parties; (n) use any communications systems provided by the Services to send unsolicited or unauthorized commercial communications, including but not limited to by email, SMS, MMS, or any other means; (o) remove, alter or obscure any proprietary notice or identification, including copyright, trademark, patent or other notices displayed on the Services; (p) mislead or attempt to mislead or defraud or attempt to defraud or conceal any information relating to Content or other information that you provide to us; (q) link, deep link, ‘frame’ or ‘mirror’ any part of the Services without our prior consent; or (r) use the Services to violate any applicable laws, rules or regulations, or for any unlawful, harmful, or inappropriate purpose, or in any manner that breaches these Terms or is otherwise objectionable, as determined by us in our sole discretion. 13. Termination, Restriction, and Suspension. (a) By us. We retain the right to terminate, restrict, or suspend these Terms and/or license to access or use the Services at any time in our absolute and sole discretion, without prior notice, for any reason or no reason, as determined by us. 14. DISCLAIMERS. IF YOU CHOOSE TO USE OUR SERVICES, YOU DO SO AT YOUR SOLE RISK. OUR SERVICES AND CONTENT ARE PROVIDED ‘AS IS’, ‘AS AVAILABLE’ AND ‘WITH ALL FAULTS’ WITHOUT WARRANTY OF ANY KIND, EITHER EXPRESS OR IMPLIED. YOU ASSUME THE RISK OF ANY AND ALL DAMAGE OR LOSS FROM USE OF, OR INABILITY TO USE, OUR SERVICES. WITHOUT LIMITING THE FOREGOING, WITH RESPECT TO THE WEBSITE, AND/OR THE SERVICES ATC EXPLICITLY DISCLAIMS ANY WARRANTIES OF MERCHANTABILITY, ACCURACY, SECURITY, FITNESS FOR A PARTICULAR PURPOSE, QUIET ENJOYMENT, QUIET TITLE, NON-INFRINGEMENT, AND ANY WARRANTIES ARISING OUT OF COURSE OF DEALING OR USAGE OF TRADE. ATC MAKES NO WARRANTY THAT THE WEBSITE, SERVICES, AND/OR CONTENT WILL MEET YOUR NEEDS, EXPECTATIONS, BE TO YOUR SATISFACTION, OR BE AVAILABLE ON AN UNINTERRUPTED, SECURE, OR ERROR-FREE, BUG-FREE, OR MALWARE-FREE BASIS. ATC MAKES NO WARRANTY REGARDING THE QUALITY OF OUR SERVICES OR CONTENT, OR THE ACCURACY, TIMELINESS, TRUTHFULNESS, COMPLETENESS OR RELIABILITY OF ANY CONTENT OBTAINED THROUGH THE SERVICES. NO ADVICE OR INFORMATION, WHETHER ORAL OR WRITTEN, OBTAINED FROM ATC OR THROUGH THE SERVICES OR CONTENT, WILL CREATE ANY WARRANTY NOT EXPRESSLY MADE HEREIN. 15. Release and Waiver of Claims. To the maximum extent permitted by applicable law, YOU ON BEHALF OF YOURSELF OR THE ENTITY THAT YOU REPRESENT, YOUR PERSONAL REPRESENTATIVES AND YOUR HEIRS, HEREBY VOLUNTARILY AGREE TO RELEASE, WAIVE, AND DISCHARGE all claims, actions, demands, suits, or proceedings (“Claims”) against US and our AFFILIATES, including any and all liability for damages (actual and or consequential), costs and expenses (including litigation costs and attorneys’ fees) of every kind and nature, INCLUDING BUT NOT LIMITED TO CLAIMS RELATING TO, BODILY INJURY, PROPERTY DAMAGE, WRONGFUL DEATH, EMOTIONAL DISTRESS, arising from or in any way related to: (A) THE SERVICES, (B) THESE TERMS, (C) YOUR DEVICE, (D) CONTENT AVAILABLE ON OUR SERVICES, (E) any inaccuracy, untimeliness or incompleteness of a USER’S representations OR WARRANTIES, and/or (F) any inaccuracy, untimeliness, or incompleteness of ANY AND ALL information and/OR CONTENT obtained or accessed by or through the Services. FURTHER, if YOU ARE A RESIDENT OF THE STATE OF CALIFORNIA, you waive your rights under California Civil Code Section 1542, which states, “A general release does not extend to claims which the creditor does not know or suspect to exist in his or her favor at the time of executing the release, which if known by him or her must have materially affected his or her settlement with the debtor.” You understand that any fact relating to any matter covered by THESE TERMS may be found to be other than now believed to be true, and accept and assume the risk of such possible differences in fact. In addition, you expressly waive and relinquish any and all rights which you may have had under any other state or federal statute or common law principle of similar effect, to the fullest extent permitted by law. 16. Limitation of Liability. TO THE EXTENT NOT PROHIBITED BY LAW, IN NO EVENT SHALL WE BE LIABLE FOR PERSONAL INJURY, PROPERTY DAMAGE, OR ANY OTHER INJURY RELATED TO OR RESULTING FROM ANY ASPECT OF OUR SERVICES, OR ANY INCIDENTAL, SPECIAL, INDIRECT, OR CONSEQUENTIAL DAMAGES, INCLUDING, WITHOUT LIMITATION, DAMAGES FOR LOSS OF PROFITS, LOSS OF DATA, OR ANY OTHER DAMAGES OR LOSSES, ARISING OUT OF (A) THE SERVICES, (B) THESE TERMS, (C) CONTENT, (D) OR ANY OTHER ASPECT OF OUR SERVICES, HOWEVER CAUSED, REGARDLESS OF THE THEORY OF LIABILITY (BREACH OF CONTRACT, A BREACH OF WARRANTY, NEGLIGENCE, PRODUCTS LIABILITY, STRICT LIABILITY, OR OTHERWISE), EVEN IF WE HAVE BEEN ADVISED OF THE POSSIBILITY OF SUCH DAMAGES. SOME JURISDICTIONS DO NOT ALLOW THE LIMITATION OF LIABILITY FOR PERSONAL INJURY, OR OF INCIDENTAL OR CONSEQUENTIAL DAMAGES, SO THIS LIMITATION MAY NOT APPLY TO YOU. In no event shall our total liability to you for all damages (regardless of whether the Claim for such damages is based in contract, tort, strict liability, or otherwise) exceed the fees paid to us by you for the Services out of which the Claims arose. The foregoing limitations will apply even if the above stated remedy fails of its essential purpose. (a) In the event that any dispute arises with respect to the Services, Terms, or any of our Policies, upon our election in our sole discretion, such dispute shall be resolved by binding arbitration in accordance with the rules of the American Arbitration Association, in Dekalb County, Georgia, and at our option, such arbitration shall be before a single neutral arbitrator selected in our sole and absolute discretion. In the event we elect not to require that a dispute arising with respect to the Services, Terms, or any of our Policies be submitted to binding arbitration as described above, any such dispute shall nevertheless be litigated in the state courts located in Dekalb County, Georgia or in the U.S. District Court for the Northern District of Georgia, as the case may be. You shall be liable for and shall reimburse us for our expenses and fees, including attorneys’ fees, in the event any arbitration or litigation arises out of, under, or relating to these Terms or any of our Policies, or your use of the Services. By using the Services, you irrevocably agree and consent to be bound to personal jurisdiction of and venue selection in the state courts located in Dekalb County, Georgia or in the U.S. District Court for the Northern District of Georgia as the case may be, whether either arbitration or litigation arises between us and you. YOU AGREE THAT ANY CAUSE OF ACTION THAT YOU MAY HAVE ARISING OUT OF OR RELATED TO THE SERVICES MUST COMMENCE WITHIN ONE (1) YEAR AFTER THE CAUSE OF ACTION ACCRUES. OTHERWISE, SUCH CAUSE OF ACTION IS PERMANENTLY BARRED. (c) You agree that irreparable harm to us would occur in the event that any of the provisions of these Terms, including but not limited to the provisions of Sections 5, 10, and 12 were not performed fully by you or were otherwise breached by you, and that money damages are an inadequate remedy for breach of the Terms because of the difficulty of ascertaining and quantifying the amount of damage that will be suffered by us in the event that these Terms are not performed in accordance with its provisions or is otherwise breached. It is accordingly hereby acknowledged that, notwithstanding any provision of this Section 17, we shall be entitled to petition the courts listed in Section 17(a) for an injunction or injunctions to restrain, enjoin and prevent a failure to perform these Terms by you, without positing bond or other security, and to enforce specifically such provisions of these Terms. (d) Dispute Resolution Severability. If a court decides that any term or provision relating to our ability to submit any above-mentioned dispute to arbitration or to the above class action wavier according to this Section 17, the parties agree to litigate any such dispute according to Section 17(a) above and to replace any other such terms or provisions of Section 17(a) or Section 17(b) with a term or provision that is valid and enforceable and that comes closest to expressing the intention of the invalid or unenforceable term or provision, and this Section 17 shall be enforceable as so modified. In any event, the remainder of these Terms will continue to apply. 18. Indemnification. You agree to indemnify, defend, and hold harmless us and our Affiliates from and against any and all Claims, losses, expenses, damages and costs (including, but not limited to, direct, incidental, consequential, exemplary and indirect damages), and reasonable attorneys’ fees, resulting from or arising out of, under, or relating to: your use, misuse, or inability to use the Services; any infringement of a third party’s rights; your Device; a breach of representation or warranty; your User Content; alterations of, loss of, or unauthorized access to any information sent or received or not sent or received by you or us; any defamatory, offensive, fraudulent, or illegal use of the Services by you; any accidental or improper disclosure of information; and any violation by you of these Terms or any of our other Policies. 19. Survival. Notwithstanding anything herein to the contrary, the provisions of Sections 3 through 10, 13 through 23, and 25 through 27 of these Terms, as well as any provision of these Terms which in accordance with its terms is intended to survive the termination of these Terms and/or your license to use or access the Services shall survive any such termination. 20. Notification. By using the Services, you agree that we may provide you with any notices or other communications electronically: (a) via email (in each case to the address that you provide), SMS message, or telephone call (in each case to the phone number that you provide), or (b) by posting to the Website. For notices made by email, the date of receipt will be deemed the date on which such notice is transmitted. We will use best efforts to honor a User’s request to opt out of promotional messages, but under no circumstances will we be liable for Posting or otherwise transmitting any Content to Users. We prefer to that you provide us with any notifications via electronic communication. However, you are able to send us paper notifications at the following address: 3533 Memorial Drive; Decatur, GA 30032. 21. Severability; No Waiver. The representations and warranties and/or covenants set forth herein are each to be construed as a separate agreement, independent of any other provisions of these Terms. Further, the invalidity or unenforceability of any provision, word, phrase, clause, sentence, paragraph or section of these Terms shall in no way affect the validity or enforceability of any other provision, word, phrase, clause, sentence, paragraph or section of these Terms, and any such invalid or unenforceable provision that is overbroad shall be deemed narrowed to the broadest term permitted by applicable law and shall be enforced as narrowed. If one or more of the provisions in these Terms is deemed invalid or unenforceable, then the remaining provisions will continue in full force and effect. Our failure to assert any right or provision under these Terms shall not constitute a waiver of such right or provision. 22. Assignment. These Terms, and any rights and licenses granted hereunder, may not be transferred or assigned by you, but may be assigned by us as determined by us. 23. Our Relationship with You. With respect to you, we are an independent contractor only. Nothing in these Terms shall be deemed or is intended to be deemed, nor shall it cause, you and ATC to be treated as partners, joint venturers, or otherwise as joint associates for profit, or either you or us to be treated as the agent of the other. 24. Third Parties. From time to time, we may engage third parties or Affiliates to assist us in providing certain aspects of the Services, including but not limited to marketing functions. You agree that we may engage such third parties in providing Services to you, as determined by us. 25. Entire Agreement; Modification. These Terms together with our Polices any other document referenced herein, including but not limited to any Ad Agreement and/or Supplemental Agreements constitutes the entire understanding between us and you with respect to the subject matter hereof. You agree that we may amend, modify, or alter these Terms and/or our Polices at any time in our sole discretion. We will notify you about changes to these Terms by placing the updated Terms on the Website. You agree that your use of the Services after such notification will constitute acceptance by you of such changes to the Terms. 26. Headings. Headings in these Terms are for convenience only, and shall not govern the meaning or interpretation of any provision of these Terms. Further, whenever the context requires, all words, including but not limited to defined capitalized terms, will include the masculine, feminine, and neutral, and each word will include the singular form, plural form, and other conjugations of that word. 28. Compliance. You represent and warrant that you shall comply with all applicable laws, statutes, ordinances, and regulations regarding use of the Service. The Services are designed and targeted to Users who reside in the United States. We make no representation that the Services are operated in accordance with the laws or regulations of, or governed by, other nations. By accessing the Services you certify that you meet the age and other eligibility requirements for use of the Services. Those who access or use the Services do so at their own volition and are entirely responsible for compliance with applicable law. Further, you agree to comply with all laws, restrictions and regulations relating to the export of items, Content, and the Services. For purposes of the U.S. Export Administration Act (“Export Laws”), you state you are: (a) not a citizen, or otherwise located within, an embargoed nation (including without limitation the Office of Foreign Assets Control (“OFAC”)) comprehensively embargoed countries of Iran, Syria, Cuba, North Korea and Sudan and certain Specially Designated Nationals listed by OFAC as updated from time to time and (b) not otherwise prohibited under the Export Laws from receiving the Services and Content. 29. Feedback. We value your comments and opinions. 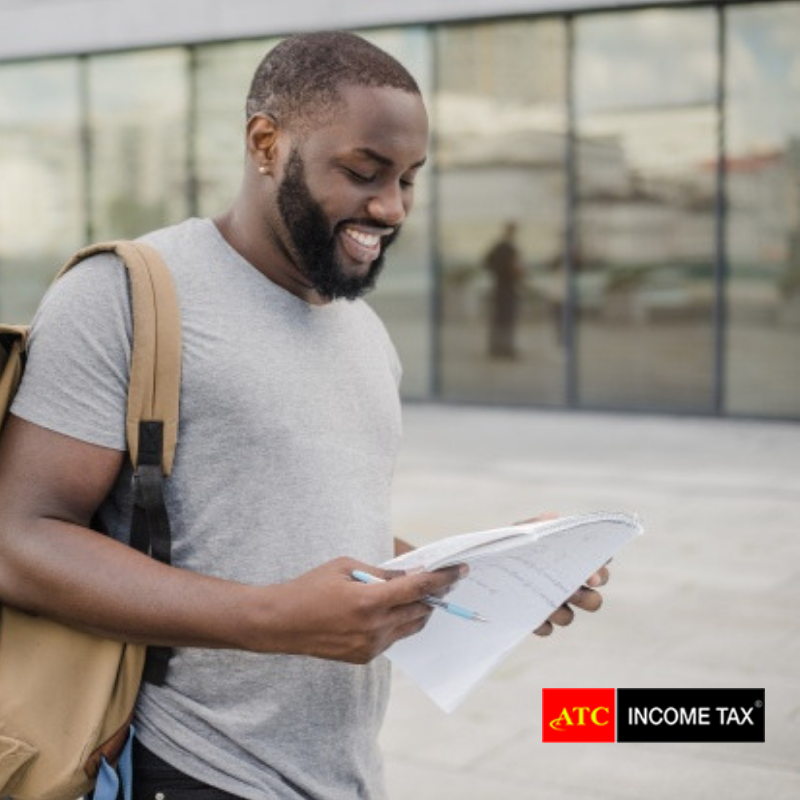 If you have questions, comments or a complaint about these Terms, you may send a written notice to us at: admin@atcincometax.com.